Thirteen year old Mattie Lee Martin took her mentally challenged older sister by the hand and led her down the rutted, red clay country road. Neither looked back. Mattie was determined her sister would not be abused again in their grandparents’ home. She’d finally accepted that her parents would never come back to get them. The road led to the town of Dothan, Alabama, and a life, Mattie Lee hoped, that would be better than the one they’d known on that god-forsaken farm. Mrs. Bender stood at the door of her variety store, broom in hand, and watched the two girls walk toward her down the sidewalk. Mattie, the spokesperson for the two, stepped forward and boldly asked, “I need work and a place where me and my sister can stay. Do you know of anything?” She looked up at Mrs. Bender quite seriously. Her black eyes were wide. Anxiety was written all over her round black face that now dripped in sweat in the hot summer day after her long walk. Mrs. Bender read in that expression that she’d gotten this far, but now the little girl was in a quandary as to what should she do now? She looked at the tight grip she had on her much larger, but obviously more dependent, sister. Mattie stood straight and said, “I don’t take no charity. I’ll pay you back.” Mrs. Bender nodded. That Jewish lady remained a dear friend to Mattie the rest of her life. Mattie Lee Martin later became highly regarded for her cooking skills. She cooked at the restaurant of the Houston Hotel for awhile and then took a job as the private cook for Dr. Moody, founder of Moody Hospital in Dothan. When the Moodys moved into their big house on Main Street from the house across from the hospital, Mattie for some reason was not going with them. Dr. Moody recommended Mattie to Dr. E. G. Burson, my father. The Moodys gave her a house as a parting gift. Mammy ordered the groceries to cook for lunch from Murphy’s Market downtown first thing in the morning and a boy on a bicycle delivered them in time for her to cook. Dinner was served at exactly 12:00 noon. (In the South we eat breakfast, dinner and supper.) The meat went on a platter before “the doctor”. The table was set precisely with forks on the left of the plate (with the napkin) and the knife (facing inward) on the right. The glass was placed above the knife. She trained us well. Mammy baked the best desserts ever to grace a dinner table: Fresh apple pie with crust into which she cut real cheddar cheese cut from a block; strawberry short cake with fresh strawberries sliced and sugared to make a juice that would sink into the cake she baked that morning topped with real sweet whipped cream; a bitter sweet chocolate pie with whipped egg white topping and homemade crust; pecan pie; Lane cake (her Christmas specialty); coconut cake; chocolate layer cake; peach, blackberry, apple cobbler; banana pudding; a coconut pie and lemon icebox pie to die for just to name a few. She cooked country cooking now labeled soul food because it was so good it soothed the soul, I think. Her vegetables swam with grease and we all swear the pot likker could make a sick man well. Fried chicken, country fried steak, fried pork chops…all with mashed potatoes or rice with gravy, turnips, sweet potatoes, collards, rutabagas, fried eggplant, and cornbread saturated with butter or fried to melt in your mouth! And do not forget that specialty of the South…fresh, sweet tea with lemon or mint. On Saturdays when Mammy heard the theme music to the TV show “Fury,” she would come pounding down the hall to watch it with me in our TV room at the opposite end of the house to the kitchen. She’d run back and forth timing cooking lunch for during the commercials. Mammy alternated cooking my sister’s, brother’s and my favorite lunch on Saturdays. When we were sick, she squeezed lemons and made a sweet/sour concoction she served with chicken noodle soup that she brought up the stairs ignoring her chronic arthritis to where we lay in our bed to make us feel better. It always worked. Mammy had worked for the aristocracy of the town, Dr. and Mrs. Earl Moody. While she often locked horns with my mother (whose own father had been killed when logs rolled off a log truck when she was 13 leaving her mother to struggle raising five children) she refused to give up on us. “Yo mama, she be mean. But I be mean too, so we get along.” Mother had been awarded campaign ribbon for service in World War II as a nurse at the Battle of the Bulge. She could curse a blue streak and did so on occasion when things did not go to suit her. Sometimes those disagreements would get so heated that Mother would fire Mammy, but we’d cry and carry on so, she’d have to go and ask her to come back. My father was a doctor and his father was a doctor and that made us worth Mammy’s time and effort. My mother might not know what was “proper” but Mammy did, and she was determined to turn us out well. Mammy gave us advice that stayed with us. My father was a doctor in a small town and Mammy thought that meant we had more responsibility than others…to him and our community. “Yo Daddy. He’s somebody You gotta be somebody, too.” She made us tea cakes when our friends came over and we had tea parties. She observed my behavior and said, “You too bossy. You ain’t nevah gonna have no friends!” I tried very hard to tone down the bossy. That sense of responsibility she drilled into me had its consequences…I tried to straighten out the world, my siblings and classmates. I was a chubby, lonely little girl, but I had Mammy as a best friend. I was not a beautiful child, but Mammy loved to brush my thick, straight hair and if nothing else I was convinced I had beautiful hair and a pretty smile. At least that’s what Mammy said. She carried my sister around in a wicker clothes basket and commanded that she be patient by balling up her fists and “holding her potatoes.” Sylvia was a precocious child who loved watching…”helping”… Mammy work at the bar in our kitchen. Mammy said, “Susan” (her name for Sylvia; she called me Shamoo) “she be smart. She can do stuff. You can’t do nothin’.” To prove my worth to Mammy I took the Ajax upstairs to our bathtub and started scrubbing. Mammy followed and said, “You gone rune yo hands. Give Mammy that!” As she struggled to kneel, bending her arthritic knees, beside the tub, she muttered, “You ain’t nevah gonna git a man you rune yo hands!”) I guess that was how I managed to snare a husband at 19. He wasn’t the same boy friend I had, the nephew of a friend of the family, who had a farm in Marianna about 30 miles south of Dothan whom I was going to pick up to come and visit us during his visit home for summer break from Louisiana Tech. I was going to take my 1966 yellow GTO convertible down to Marianna and find the farm. Mammy was assigned chaperone duty. We set out and Mammy directed me to her house first. Later I found out Mammy got her gun and settled it under the brown felt hat she wore on her head. Mammy was not going to “put up with any truck” with the boyfriend or anyone else. One of the lullabies I sang my children was the one I heard from Mammy as she cradled my brother and sister on her lap and rocked them left to right. “Bye oh bye oh bay oh bay oh by oh by oh bay” she’d chant and it carried so much love. She sang the same song to my children when they came. If there isn’t such a term as GrandMammy there should be because she loved them and they loved her just that much. She called my brother “Little Man” and adored him. Her best friend on Cherry Street was Perlie Mae Jackson for whom she got a job with my father’s partner in his medical practice. 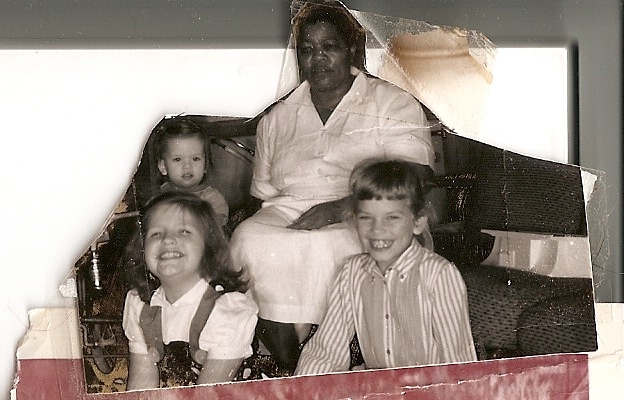 Mammy did have her own family…a daughter Lucy Mae Dixon who was my Mother’s age. Mammy had very little education herself and the lists she made could barely be read, so she valued a good education. Mammy skrimped and saved and sent her to college in the North. It must have been a Catholic college because Lucy Mae converted to Catholicism. Mammy was a dedicated member of the Cherry Street AME Church. Lucy earned her Masters and came home to teach. Mammy bought her items of silver “on time” as birthday gifts. The mahogany furniture in their living areas was always covered in plastic to “save” it. Lucy adopted a daughter. She was a beautiful child, but I always thought the adopted daughter was a bit ashamed of her adopted family. Lucy made sure she knew her real parents were educated people. The adopted daughter left Dothan as soon as she could. I guess Mammy told my brother and sister the same thing she drilled into me. “Yo daddy be somebody. You gotta be somebody.” My sister is a cardiologist in New Orleans (Dr. Sylvia Burson Rushing) and my brother (Elkanah George Burson III ) has just started a pharmaceutical company (Burel Pharmaceuticals). Me? After you’ve got a man it’s all right “to rune yo hands” with Ajax, I learned. I wash a mean bathtub and have stayed married to the same man, an attorney of whom she approved (whose family once owned the Houston Hotel where she had worked) for forty years doing a little teaching and writing. This humble generous woman whom I never saw wear a single piece of jewelry gave me a pearl and gold bracelet for graduation from high school. She who worked from can to can’t all of her life gave me a silver goblet when I got married. I wonder if she ever knew how much they mean to me and that I realize the sacrifice and love those gifts demonstrated. I once dreamt Mammy and I were on a train traveling to some unknown destination. I felt danger in the dream but from what source, I don’t know. Mammy took the aisle seat and told me not to look at anyone or smile at anyone. I knew she feared they would hurt us, but they’d have to get through her to get to me. She glowered at everyone. We were exhausted when finally we came to a place where we made our way to a hotel. The man at the desk said I could stay, but Mammy could not. Mammy told me to go into the room and rest; she would wait on the street until morning and then we would again make our way to the train and our destination. I knew there were dangers all around and Mammy would be out in the middle of it. I remember the horror at thinking of being separated from Mammy. I think that place is what Hell would be like. I would not stay without her. “We’ll get back on that train and go to Muddin’s (my grandmother that had already gone to Heaven). In the dream we got off the train at the tracks that ran through Brewton and Muddin came to get us. She took us to her house just blocks from the tracks where we were all safe and we all slept in the same bedroom in the two double beds in my grandmother’s little house where all her grandchildren slept with her. My glimpse of Heaven. How could it be that there was a place that I could stay and Mammy couldn’t? Mammy was a proud person who made the most of her situation and, selflessly, with hard work and determination earned respect and made a good life for herself and her family. She raised us, her white family, to believe we could do whatever we chose to do and that we should make our parents proud. She drilled into us values of honesty, integrity, and a sense of responsibility. Because we had been given so much; much was expected. Because we loved her, it was Mammy we wanted to make proud. Museum is the Amistad Center which houses a collection of African American Memorabilia. 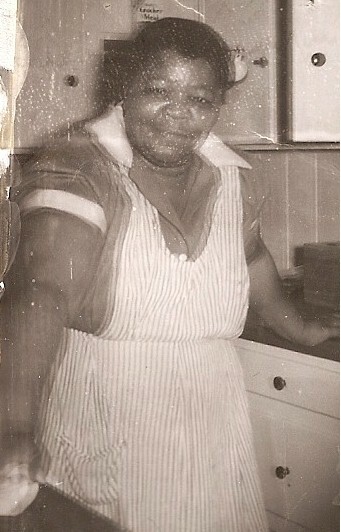 Mammy would be so honored, I can think of no greater homage to the wonderful woman I knew as my “Mammy”. What a wonderful piece. I was born in 1960, Birmingham, Alabama I too had a mammy named Alice, she will never know the effect that she has had upon my life, growing up in such a cunfusing social climate. She definatley made an imprint upon my life,and the life of my family and as long as I live I will always remember Alice. Beautiful story thanks for sharing. I loved Mammy and I loved the brief anecdote about your grandmother Muddin. I’ve always had a strange interest in the lives of people ill never know and their worlds. This made me cry because my mother Lillie Mae Burks was also a “Mammy” for the Spann family in Dothan, Alabam. I remember going to visit my mother on Saturdays at work on Laurel Dr in Dothan and she would always make me a plate of food to eat. Your story and memories remind me so much of my mother and all the things she did and went through with the Spann family. Thank you for sharing. Oh, my father Rev. Timothy Burks was also a Pastor at Cherry St Church. 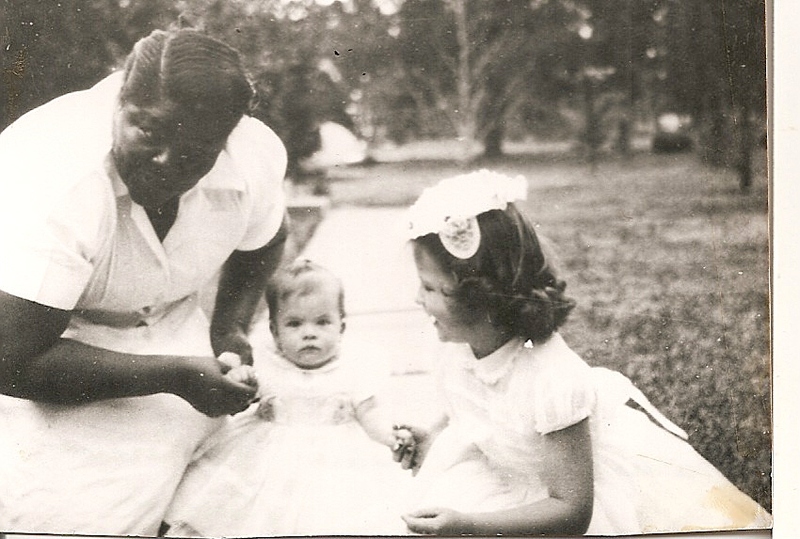 There are Thousands of “Mammy” in the south whose white family’s loved and adored. We didn’t always have a lot of material thing but we had a whole lot of love in our family. Again, thank you for sharing your Manmy story. There are many of these African/European American relationships that are simply about human connection and love even in the face of terrible racism and discrimination that are based on our history of slavery. Yet, some African American women who served white families as maids, cooks and childraisiers did have feelings for the white family. Surely, anyone who bonds with young children and babies must sometimes have an instinct to care for and protect for them. They are adored and loved but inequalities make it difficult to measure the simplicity of these emotions. However, we can slight these emotions, however complicated they are. Thank you for posting. Would love to learn any additional thoughts. Mattie Lee Martin was my adoptive grandmother. This is a very beautiful piece. I still carry a picture of her in my wallet with Ms Sharman and Ms Sylvia to this very day. I’m not as ashamed as where I came from as I am ashamed of where I have been and that I did not appreciate what I had at the time. No reason for shame. I have shame that my ancestors were slave owners and that my family perpetuated the atrocities of Jim Crow. I did not grow up with someone to take care of me like a “manny.” But many of my friends did and I envied them. Thank you for replying to the post. PS Did you know about the tribute before you saw it on Just Like Family? You are currently reading I Remember Mammy at JUST LIKE FAMILY.